Saturday morning we were up early to pack up Phaeton Place and load our suitcases into our Vue for our trip to Calgary. 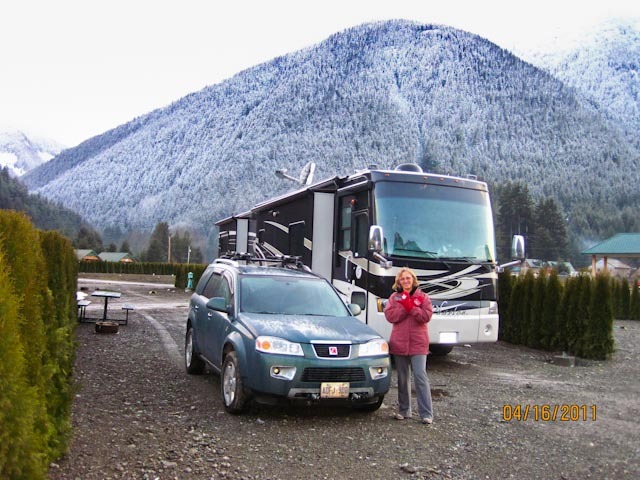 We were a little surprised to see the campground covered in an inch or more of wet snow. The melt was on but wasn’t happening fast enough for us to get on the road so yours truly was on the ladder and onto the roof sweeping snow and ice from the slideout toppers. We emptied all our tanks and tripped most of the breakers for everything except the inverter and our residential refrigerator. We also unlplugged all our electrical appliances. Temps haven’t been below freezing at Sunshine Valley for over two weeks so I am hoping we made the right call in not winterizing Phaeton Place during our absence, that is to say not adding antifreeze to our water lines. We hit the road for Salmon Arm area shortly after 11 am. The Coquihalla to Kamloops was in good shape with only a bit of wet road surface and blowing snow to worry about near the summit. The weather looked worse to the east of Merrit on Hwy 5 into Kelowna so we were glad we made the decision to leave PP in Hope. We did see 3 or 4 motorhomes with toads heading south from Kamloops on the Coquihalla but none going in our direction. We spent last night with long time friends Garry & Jean near Salmon Arm. We watched the Vancouver Canucks take a 3-0 series lead over the home town Chicago Blackhawks. Could this possibly be THE year for Canuck fans?? We had a wonderful supper and then played more than a few games of pool. Before we knew it, it was almost midnight and time to rest our weary bones. Thank you guys for a wonderful evening. Today’s drive took us through some breathtaking scenery through the Rockies. We saw plenty of sunshine on the British Columbia side but once we entered Alberta the temps dropped and grey skies were the norm. We arrived in Canmore just after 4 pm and will spend the night here before the final leg of our trip into Leduc tomorrow afternoon. Smugmug appears to be having some technical issues this evening so the above photo has been uploaded from my laptop instead of coming from Smugmug like most of my photos do. 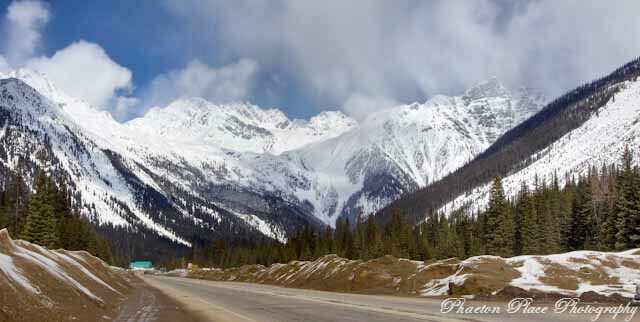 This entry was posted in Alberta, British Columbia, Campgrounds, Photography. The Canadian Rockies is in some of the most beautiful country I've ever seen….Love that snow photo..just as long as you keep it there.